ARCA Racing Series presented by Menards veteran John Wes Townley has a secret weapon at Daytona; his name is Kevin Reed. Townley, in a brand new Zaxby’s Chevrolet, returned to the Gatorade Victory Lane at Daytona Int’l Speedway with an old friend. 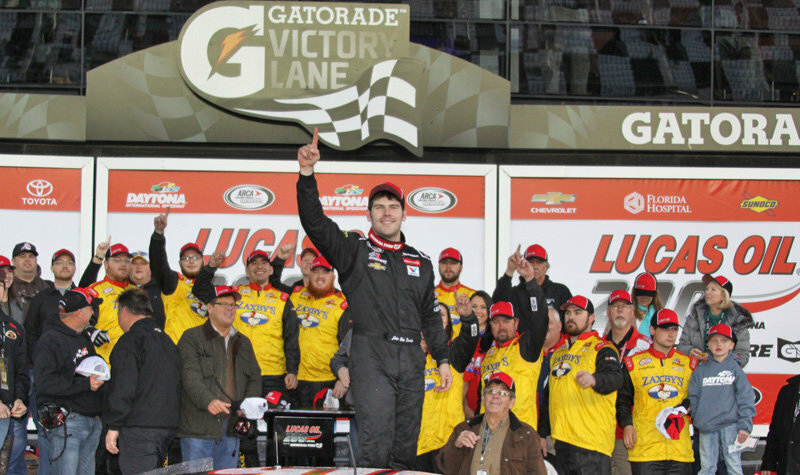 Reed who crew-chiefed Townley to Victory Lane in 2013 at Daytona with a different team, reunited with Townley just in time to win the Lucas Oil 200 Driven By General Tire Saturday afternoon. However, Reed wasn’t the only secret weapon Townley had during the 80-lap, 200-mile race. The win not only reunited Townley with Reed, it was the first win for the new Tony Townley-owned Athenian Motorsports team. Eighteen-year-old rookie William Byron, in the No. 55 Liberty University Toyota, finished second, three lengths away (.209 seconds/margin of victory) at the final stripe. It was Byron’s career-first start at Daytona. “I was really looking, watching my mirrors to see what we might be able to do,” said Byron, who tied his career-best ARCA finish. “I came over the radio to see if I could back up to anyone to get a run, but by then we were only in a tight pack of three, so I had to sit tight. Byron also earned the SCOTT Highest Finishing Rookie of the Race award. Kyle Weatherman, in the No. 58 Lira Motorsports Ford, battled from the 32nd starting position on very little practice as a result of an engine change Friday. The Wentzville, Missouri driver also barely missed a multi-car crash just as the leaders began the third lap. Weatherman was referring to a nine-car wreck in the tri-oval, triggered when Derrick Lancaster made contact with Cole Powell in a tight pack. Bobby Gerhart, Kevin Thomas, Jr., Shane Lee, Austin Wayne Self, Jairo Avila, Mark Thompson, Cole Powell, Lancaster and Gus Dean were involved. Gerhart, Self, Lee, Dean and Avila were evaluated in the infield care center and released. Chase Briscoe, in the No. 77 Cunningham Motorsports Dodge, finished fourth in his Daytona debut. Frank Kimmel finished fifth in the No. 46 JUICE Batteries Ford for Team Stange, a brand new team for Kimmel. Bo LeMastus finished a career-best sixth in his own No. 42 Crosley Brands Dodge. Kevin Thomas, Jr., in a second Cunningham car, finished seventh in his series debut in the No. 22 Bakken Concrete-KT Construction Services Dodge. Willie Mullins, with some help from his crew chief Andy Belmont, finished a career-best eighth in his Daytona debut in the No. 34 Bugsy’s Auto Repair-Crow Wing Recycling Ford. Gray Gaulding, who turned 18 on February 10, finished ninth in his series debut in the No. 38 Krispy Kreme Ford. Cole Custer rounded out the top-10 finishers in the No. 54 Haas Automation Chevrolet, a car fielded by Ken Schrader Racing. Custer also won the Menards Pole Award presented by Ansell and led the most laps – 42 overall. Townley spent much of the race outside the leader Custer, but once the Watkinsville, Georgia driver got to the bottom on lap 50, no driver could find a way around the eventual winner. Will Kimmel was a strong contender all day, leading five laps in the back half of the race, but ran out of gas under five laps remaining, relegating the Sellersburg, Indiana driver to 18th in the final running order. Despite a red flag for the aforementioned pile-up for 11 minutes, the race, which also included three cautions, was completed in one hour, 27 minutes and 45 seconds. The next event for the ARCA Racing Series presented by Menards is on April 9 at Nashville Fairgrounds Speedway. After starting fourth in Friday night’s NASCAR Camping World Truck Series (NCWTS) Lucas Oil 200, Tyler Reddick tamed “the Monster Mile” at Dover International Speedway, as he finishes ahead of Daniel Suarez (by 1.255 seconds) for the victory. Reddick, who won the 2015 NCWTS season opener at Daytona, received his second series victory and fifth top-10 finish of the season, his second series career victory and his first series victory at Dover. Following Reddick and Suarez to the drop of the checkered flag were series Rookie of the Year (ROTY) contenders, Erik Jones and Daniel Hemric finishing third and fourth respectively, and the current points leader Matt Crafton finished fifth. Rounding out the top-10 finishing positions were Ben Kennedy taking sixth, pole-sitter Ryan Blaney seventh, RORY contender Brandon Jones eighth, Johnny Sauter ninth and Tyler Young bringing home 10th-place. With his fifth-place finish, Matt Crafton leaves Dover with a 11-point lead over today’s winner, Tyler Reddick. Time of Race: 1 Hrs, 56 Mins, 31 Secs. Next Up: The WinStar World Casino & Resort 400(k) at Texas Motor Speedway on Friday, June 5th, with an approximate starting time of 9:20 p,m. (ET) and television coverage provided by FOX Sports 1. Grant Enfinger is getting used to going to victory lane. So is the No. 23 car. Enfinger won the Lucas Oil 200 presented by AutoZone, grabbing the lead on lap 53 and staying in front until the checkered flag fell at lap 80. It was Enfinger’s ninth career ARCA Racing Series presented by Menards win and second straight at Daytona International Speedway. Three Venturini Motorsports drivers finished in the top five. One of them, Daniel Suarez, finished second in the No. 15 Arris Toyota. The others were fourth place finisher Cody Coughlin in the No. 55 JEGS Toyota and Frank Kimmel fifth in the No. 25 Ansell-Menards Toyota. Brett Hudson earned a top-five, finishing third in his No. 09 Dodge. Suarez, who will be racing full-time in the NASCAR Xfinity Series in 2015, said he spent some time earlier in the week thinking about where he wanted to be late in the race in order to get to the front; it just didn’t work out. Hudson, from Owensboro, Ky., finished a career-best third after starting fourth in a career-best weekend for him. Defending series champion Mason Mitchell finished sixth in his No. 78 Mason Mitchell Motorsports Ford Fusion. Mitchell started 23rd. Matt Kurzejewski was seventh in the Lexington Inn & Suites Daytona Beach Chevrolet with Scott Sheldon eighth in the No. 20 Allegiant Travel Chevrolet. Josh Williams was ninth in the No. 6 Southwest Florida Cable Construction-Go Puck Ford and Will Kimmel completed the top-10 in his No. 69 Vogtland Springs-AmericanMuscle.com-Accel Ford. Menards Pole Award presented by Ansell winner Mark Thompson finished 14th in the No. 11 Phoenix Air Toyota. Twenty-seven cars finished on the lead lap. There were three cautions for 23 laps, the last coming when the cars of Leilani Munter, Bobby Gerhart and Buster Graham were caught up in an accident. During that caution the No. 1 car of J.J. Pack caught fire, forcing him to stop his car and exit. There were no injuries. The race took one hour, thirty minutes and 25 seconds to complete for an average speed of 132.719 mph. Coughlin led the first eight laps and made an impressive save late in the race when his car got sideways in the draft. Frank Kimmel led 27 laps, Gerhart led three laps and Sheldon led laps 47 to 52. Enfinger, who led seven laps earlier in the race, led from lap 53 until the checkered flag. Enfinger started 2014 with a win at Daytona. He would go on to win two more consecutive races to start the season and six before it was over. He was second in the final point standings. Enfinger spent those last few laps – after the restart with 15 laps to go – with Suarez in his mirror. He said he drove most of the remaining laps checking the mirrors. Enfinger’s No. 23 Alamo Chevrolet was hugging the bottom during the closing laps. The Fairhope, Ala. driver is expected to race a full season with GMS Racing. The ARCA Racing Series has a bit of a break before its second race of the season, which will be March 14 at Mobile International Speedway in Mobile, Ala.
Kyle Busch wins the NASCAR Trucks Lucas Oil 200 at the MonsterMile. It was another dominate performance in the NASCAR Camping World Truck Series (NCWTS) by Kyle Busch Friday night at Dover International Speedway, as he starts from the pole and ends in victory lane with win in the Lucas Oil 200. Busch, who led the most laps – 150 out of 200, received his fourth series victory of the 2014 season, his fifth consecutive series victory, his thirty-ninth series career victory, and his fourth series victory at Dover International Speedway. Series regular, Ryan Blaney, followed Kyle Busch to the drop of the checkered flag (by 2.123 sec.) and was followed by Johnny Sauter finishing third, an incredible finish by Brandon Jones (started 29th) fourth and Joey Coulter finishing fifth. Rounding out the top-ten finishing positions were John Hunter Nemechek finishing sixth, series Sunoco Rookie of the Year (ROTY) candidates, Ben Kennedy and Tyler Reddick taking seventh and eighth-place respectively, German Quiroga, Jr. ninth and the current series points leader, Timothy Peters (leaves Dover with a 1-point lead over Matt Crafton & Johnny Sauter) finished tenth. Time of Race: 01 Hrs, 57 Mins, 12 Secs. Next Up: The WinStar World Casino & Resort 400(k) at Texas Motor Speedway on Friday, the night of June 6th, with an approximate starting time of 9:20 p.m. (ET) and (pre) race television coverage starting at 8:30 p.m. (ET) provided by FOX Sports 1. Once again, in the NASCAR Camping World Truck Series (NCWTS) at Dover International Speedway, it was Kyle Busch – with a lap speed of 156.788 m.p.h. – showing the fastest way around the track during the final Lucas Oil 200 practice session. Ryan Blaney was second fastest in the session with a lap speed of 156.590 m.p.h, and was followed by Timothy Peters (155.912 m.p.h.) who was third, Matt Crafton (155.461) fourth and Darrell Wallace, Jr. (155.179) was fifth. Series ROTY contender, Tyler Reddick (154.248 m.p.h.) put down the sixth fastest lap speed, while John Hunter Nemechek (154.235) was seventh, Johnny Sauter (154.169) eighth, German Quiroga, Jr. (154.044) ninth and Jeb Burton (154.030) rounds out the top-ten. The 15th annual Lucas Oil 200 is scheduled to get underway around 5:50 p.m. (ET) this evening, and FOX Sports 1 will provide television coverage of the event. Rain washes out Truck Series qualifying cancelled; Kyle Busch on Pole. Rain at Dover International Speedway on Thursday played havoc with the NASCAR Camping World Truck Series (NCWTS) teams with getting in some practice for Friday’s Lucas Oil 200. The first session was a total washout and the second session was regulated to 75-minutes, but rains returned and ended practice a little over 48-minutes into the session. At the end of the session, and with a lap speed of 156.488 m.p.h., was Kyle Busch at the top of the scoring plyon with the quickest lap. German Quiroga, Jr., put up the second quickest lap speed of 154.919 m.p.h, and he was followed by John Hunter Nemechek (154.905 m.p.h.) who was third, Darrell Wallace, Jr. (154.852) fourth and Timothy Peters (154.493) was fifth. Series Sunoco Rookie of the Year (ROTY) candidate, Tyler Reddick (153.538 m.ph.) posted the sixth quickest lap speed, while Matt Crafton (153.165) was seventh, John Wes Townley (153.100) eighth, ROTY candidate Ben Kennedy (152.853) ninth and Johnny Sauter (152.607) rounding out the top-ten. With only 35 drivers attempting to fill the 36-truck field, there was no one failing to make the starting lineup. The 15th annual Lucas Oil 200 is scheduled to get underway around 5:50 p.m. (ET) Friday evening, and FOX Sports 1 will provide television coverage of the event.